1 On the Standard toolbar, click File, Save As. The Save As dialog box appears (see Figure 29-5). Figure 29-5. The Save As dialog box displays the contents of the default folder. In the Save In box, click the drive or folder where you want to save the file. If necessary, double-click the folder in which you want to save the file. 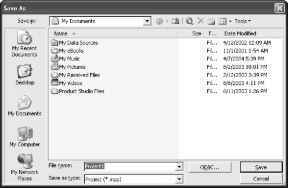 In the File Name box, type the name of the file. Click Save. After saving a file with a name and in a specific location, be sure to save continually during your work session. A good rule of thumb is to save about every five minutes, or anytime after Save you make significant changes that you wouldn't want to lose in the event of a system failure or power outage. On the Standard toolbar, click the Save button or press Ctrl+S. 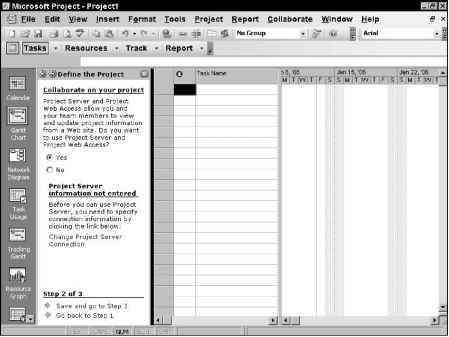 You can have Microsoft Project automatically and periodically save your file so you don't have to remember to do so. 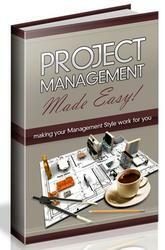 See "Saving Project Files Automatically" later in this chapter on page 875.